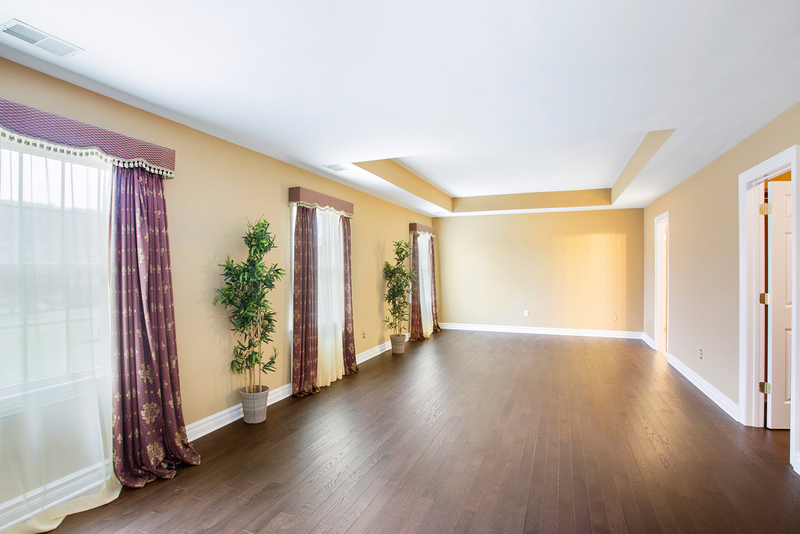 This immaculate four bedroom custom home has a rare blend of elegance and warmth. 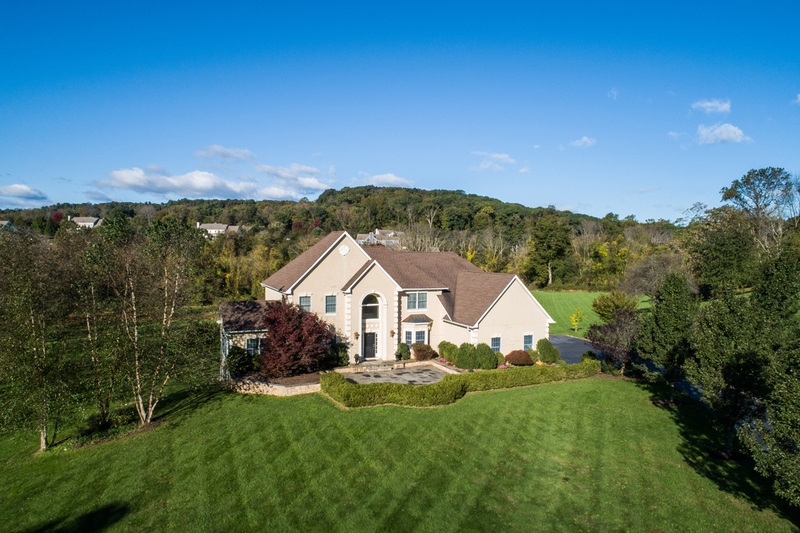 The home is nestled on over four parklike acres set back from the road at the end of a gracefully-curving driveway lined by mature ornamental pear trees. The home’s interior features include a well-conceived floor plan that is open and flowing for entertaining while also practical for daily living. 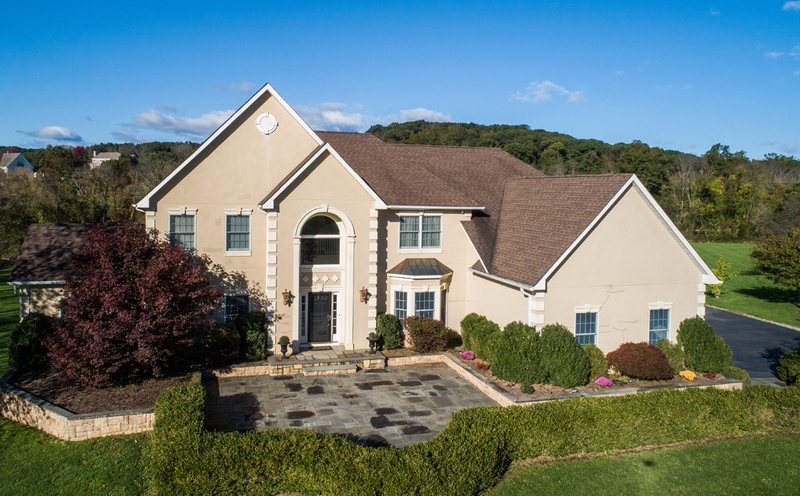 Thorough and detailed finishes accent the elegant simplicity of the architecture of the home and include many custom features including a formal foyer, newly-refinished hardwood floors throughout, tray ceilings, and an expansive finished, walkout basement. 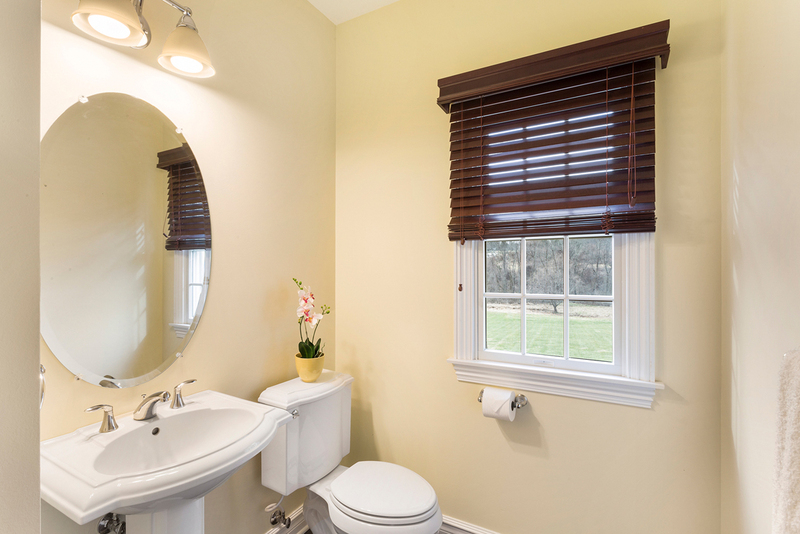 The home’s plentiful custom windows and recessed lighting bring natural and supplemental light into the home throughout the day. The formal entrance to the home is accented by a large bluestone courtyard patio with mature plantings and leads to the stone steps and front door landing. 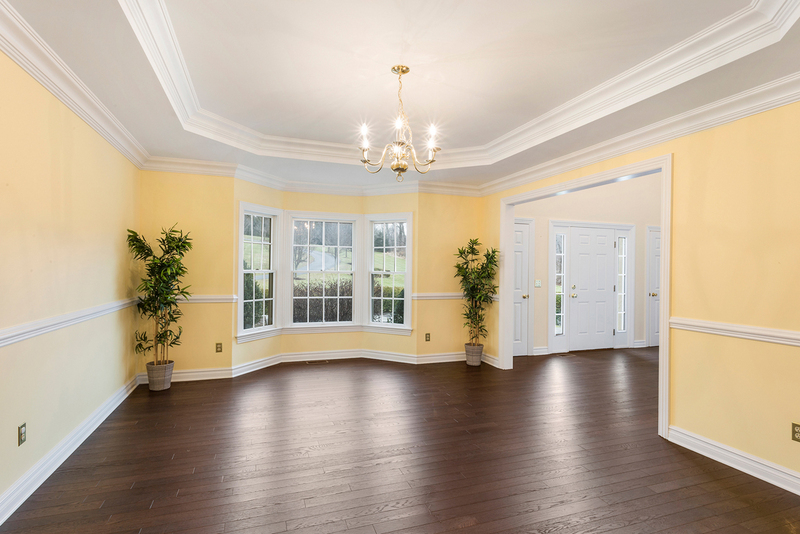 Guests are welcomed to a foyer with high ceilings which is united with adjacent rooms by continuous hardwood flooring and open lines of sight to the other entertaining rooms in the home, including the living room, dining room, kitchen, and family room. The spacious eat-­in kitchen overlooks the views at the back of the property and features custom maple cabinetry, brushed nickel hardware, granite countertops, ceramic tile backsplash with accent tiles, and recessed lighting. 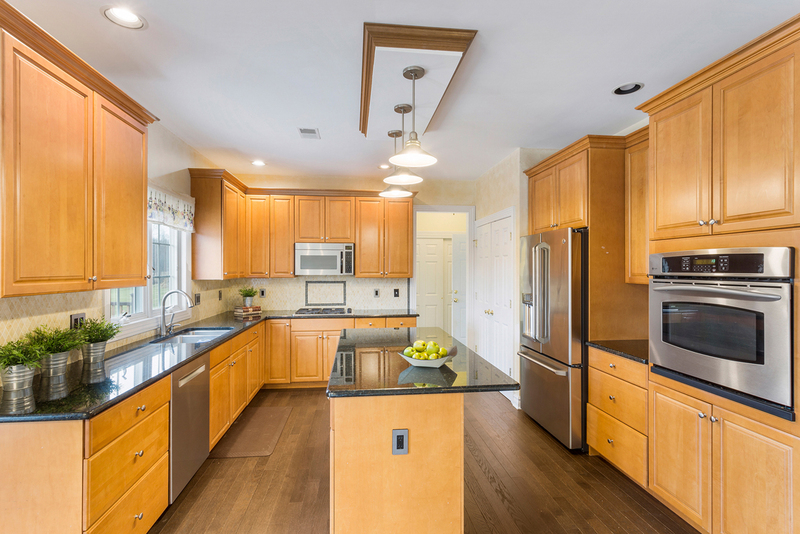 The center island offers additional storage and workspace with cabinetry and countertops matching the rest of the kitchen, electric receptacles for using small appliances, and a breakfast bar accommodating four stools. 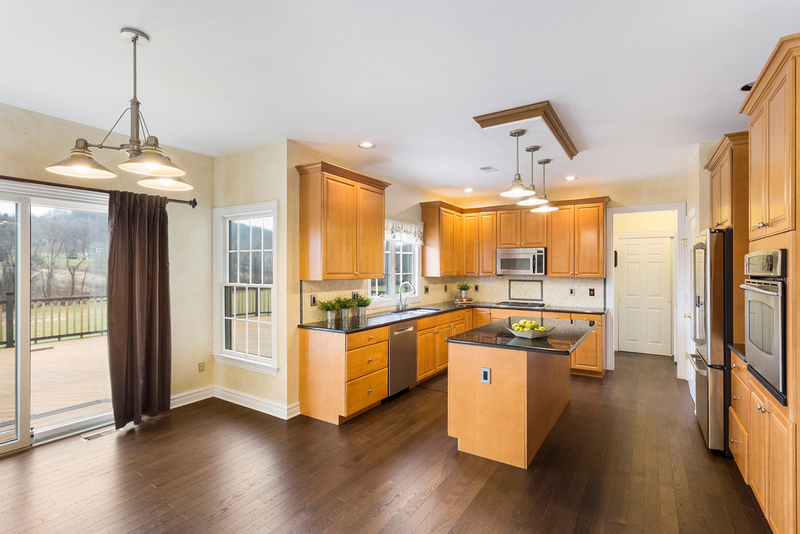 The center island is is accented by three suspended pendant light fixtures. Appliances in the kitchen include a stainless steel French door GE Profile refrigerator with built in Keurig, a stainless steel GE Profile wall oven, and a GE Profile gas cooktop, GE Profile microwave above, and a Bosch stainless steel dishwasher. The eat-in area of the kitchen connects to the deck and backyard by way of sliding glass doors, enhancing the opportunities for indoor/outdoor entertaining in warmer months. The kitchen is separated from the family room by a half-wall which defines the spaces as separate while maintaining the open lines of sight that characterize the first floor of the home. 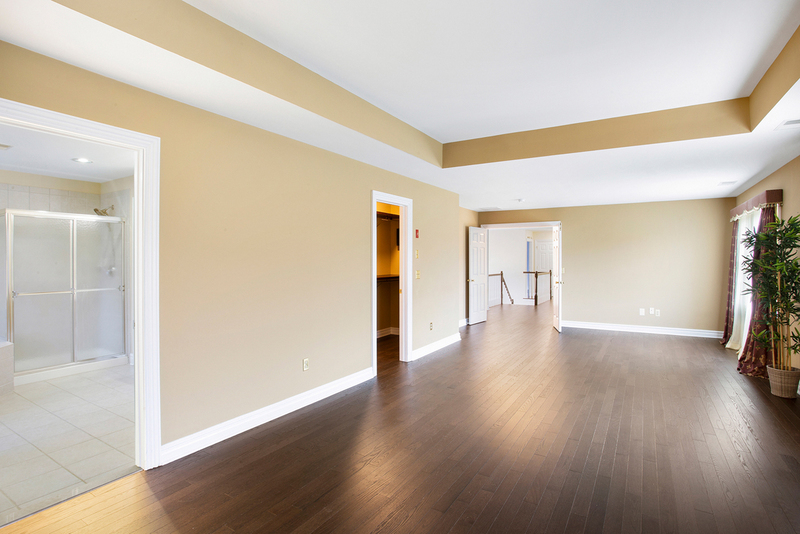 The family room features soaring cathedral ceilings, abundant natural light, and hardwood floors. 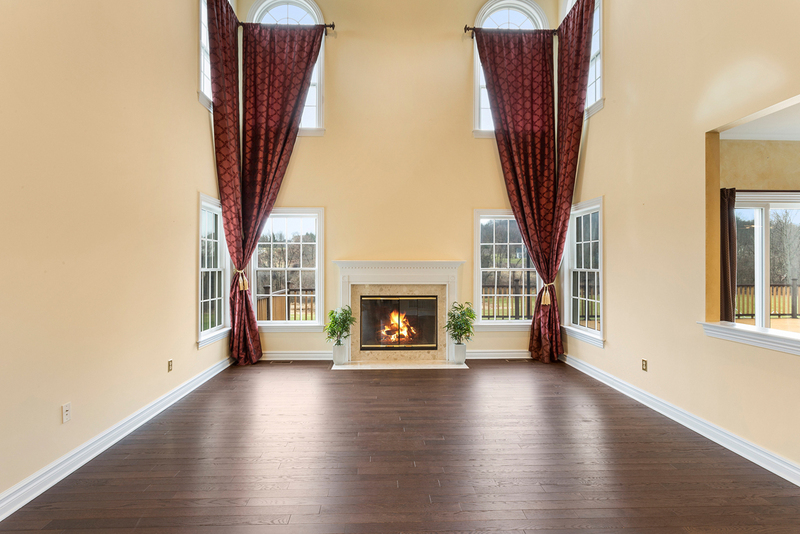 The focal point of the room is a wood-burning fireplace with wood mantle and granite surround accented by two stories of windows flanking each side of the fireplace. 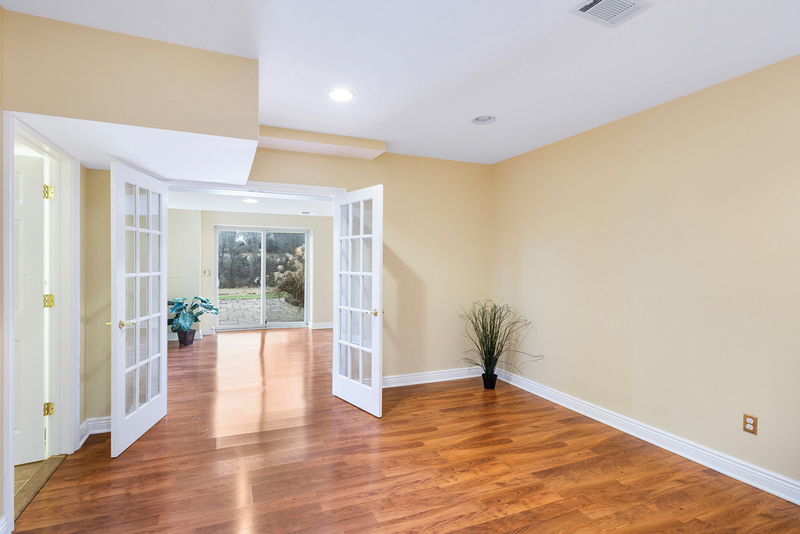 A first floor office/den and powder room can be accessed from a hallway off near the family room. 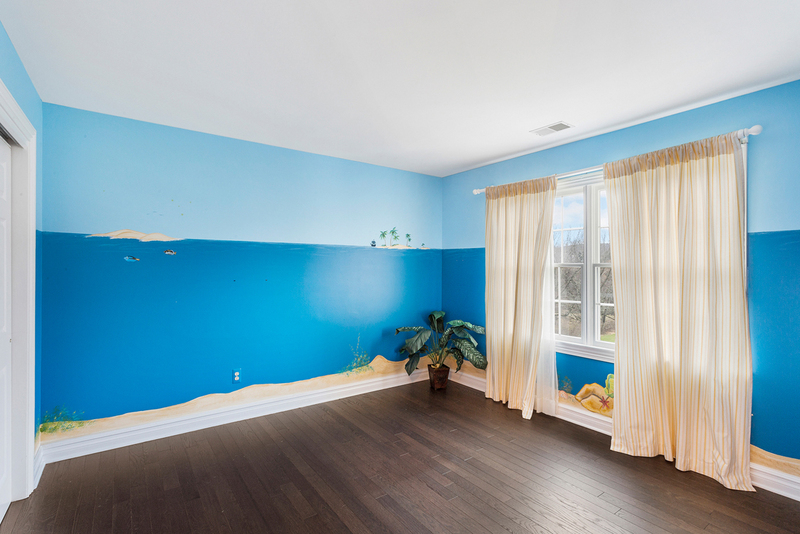 The office features a double window overlooking the backyard and because of the adjacent location it can also be used as an occasional guest bedroom. The large dining room features a bay with three large east-facing windows overlooking the front of the property, chair rail molding detail, a tray ceiling, and hardwood floors. 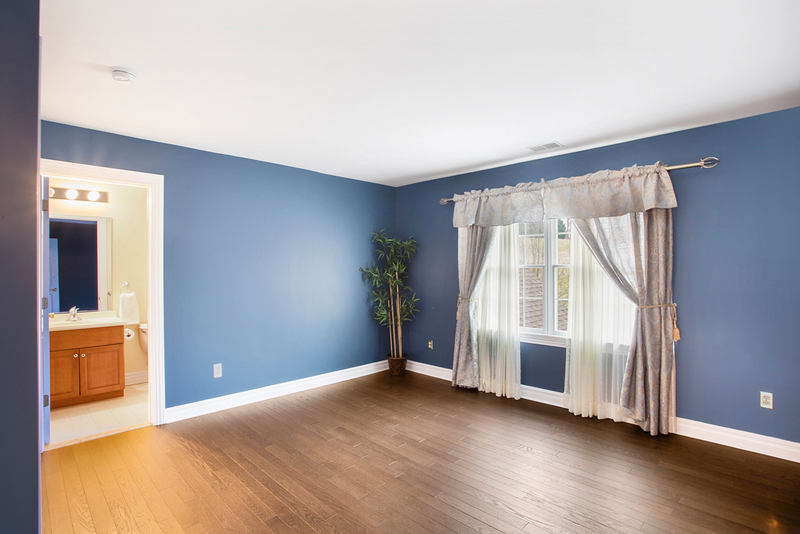 The room effortlessly accommodates a large table dining table and other furniture. It can be accessed from either the kitchen or the foyer through a large, welcoming doorways. 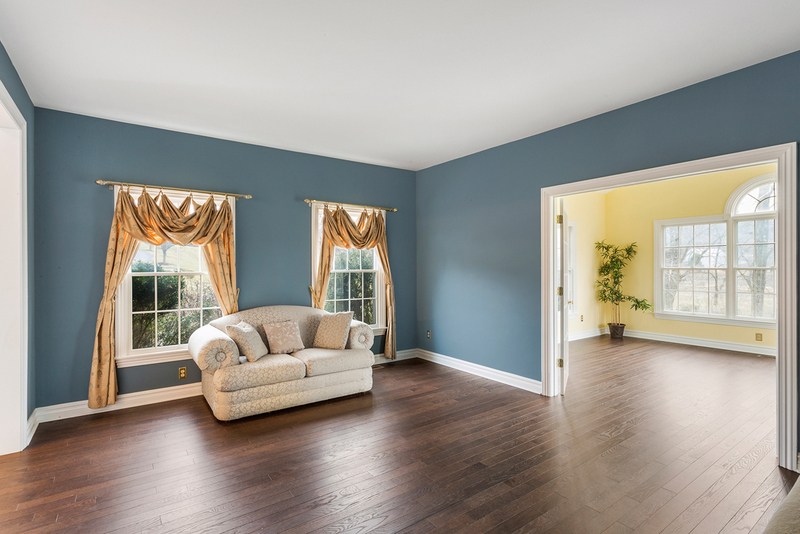 The formal living room is on the opposite side of the foyer from the dining room. It features two large windows overlooking the front yard, hardwood floors, decorative moldings, and double French doors leading to the adjoining sunroom. 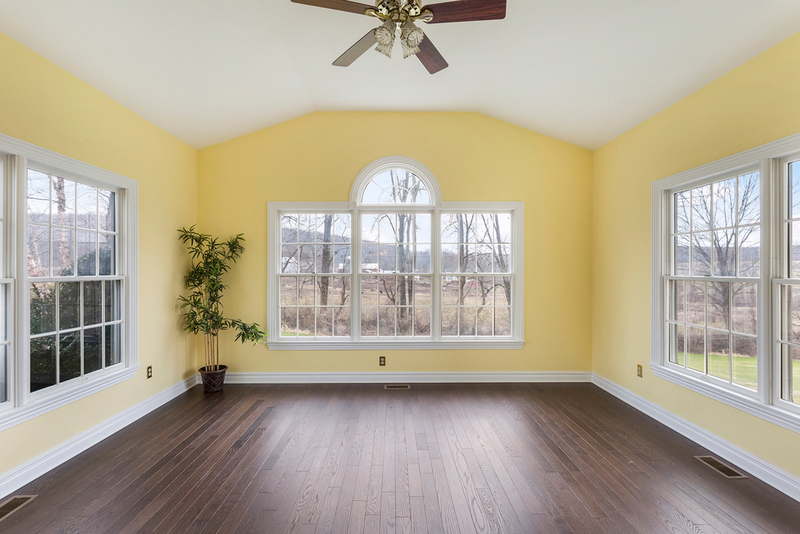 The sunroom has large windows on all three walls (facing east, west, and south) and would be ideal for use as a study, library, music room, or additional home office. The first floor service area off of the kitchen serves as a mudroom with closet and is connected to the laundry room, and three car garage. 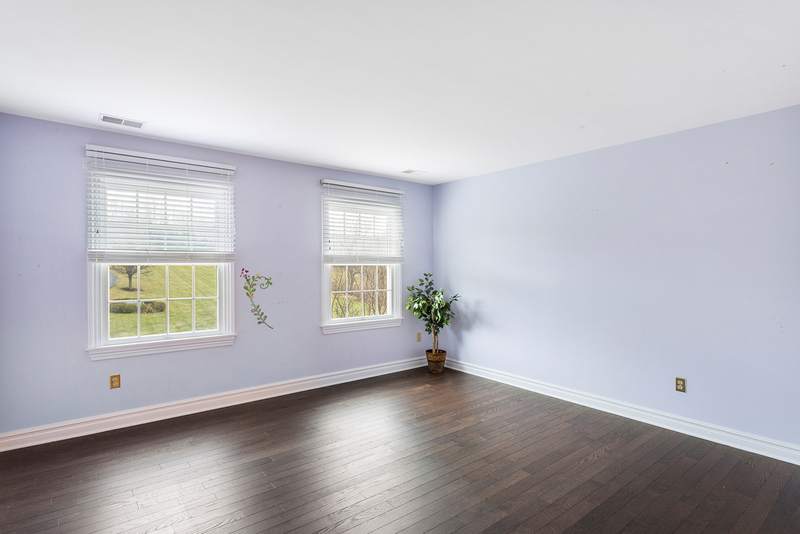 The service area space has the same finish quality as the rest of the home. 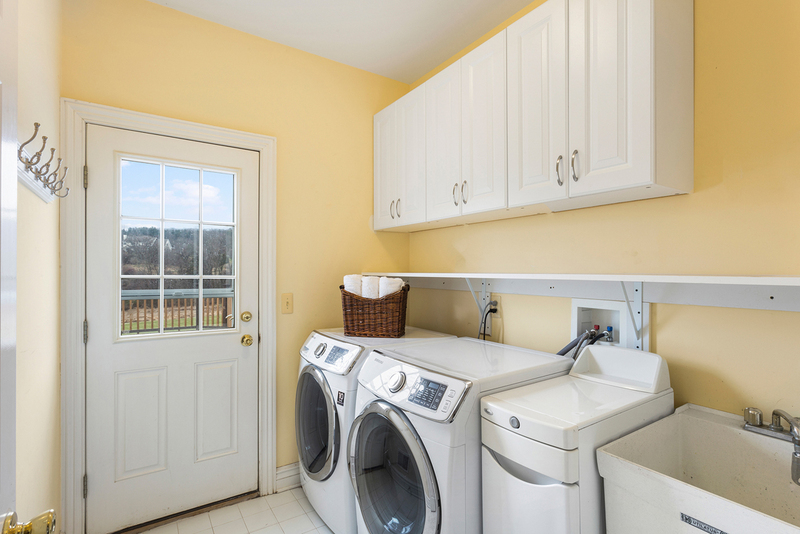 The laundry room has built-­in cabinets, a sink, and access to the deck. The attached garage with additional loft storage has automatic door openers with battery backup on each of the three bays and room for storage. 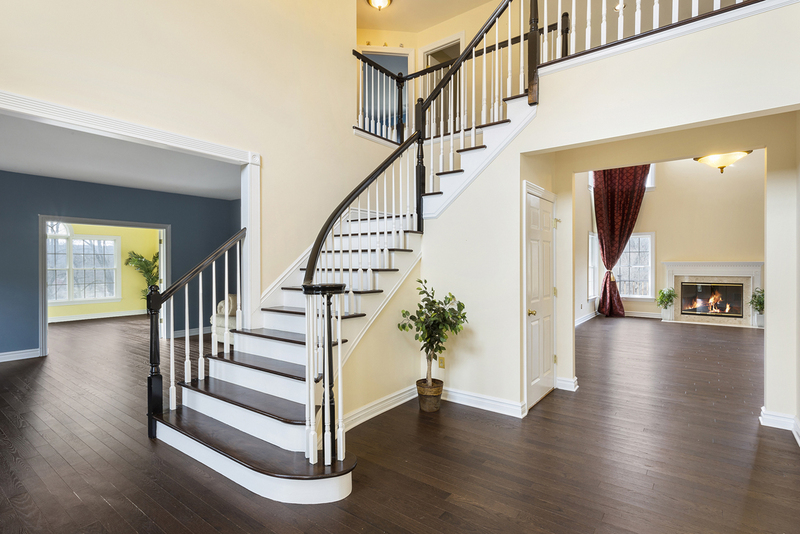 A wide staircase leads to the second floor where the four bedrooms can be found. The spacious master bedroom suite features a sitting area, a large walk-­in closets with custom shelving and drawers, views over the backyard, and a large, well-lit bathroom. 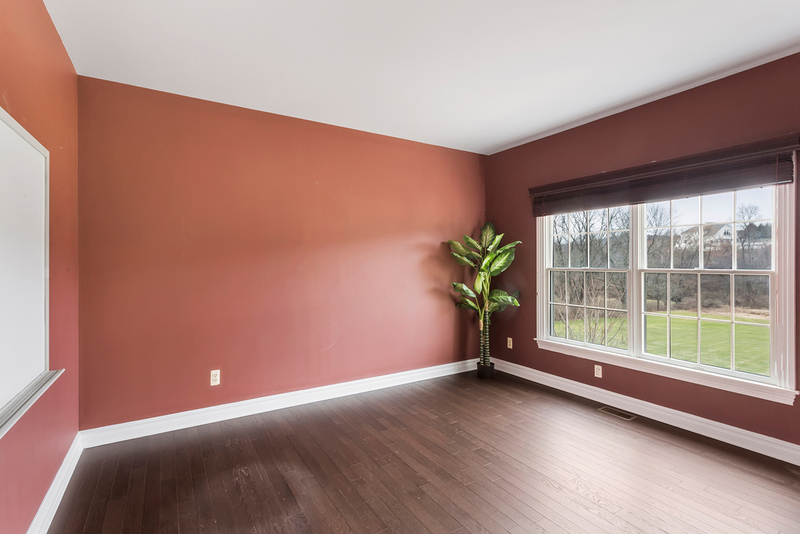 The bedroom and sitting area feature neutral carpeting. 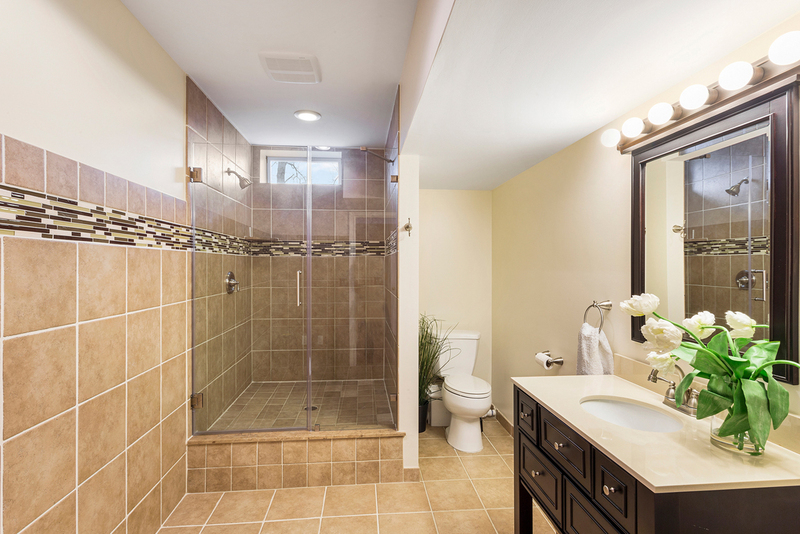 The master bathroom features a soaking tub, wood vanity with double sinks, large shower stall with sliding doors, a separate toilet room, and a storage closet with built in wall safe. The three additional bedrooms of the house are all on the second level of the home. Each is very generously-sized with hardwood floors and sun-filled windows overlooking the property. 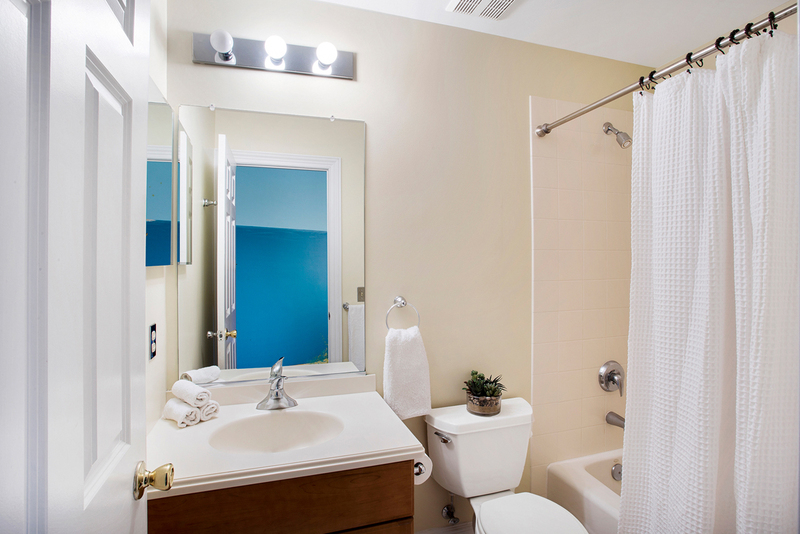 The second bedroom features an ensuite full bathroom with a tub shower. 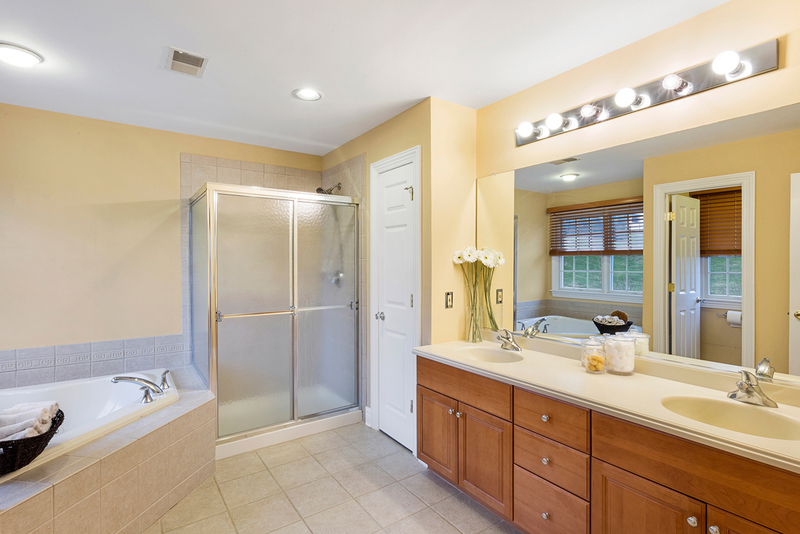 The main bathroom has a tub/shower and sink/vanity with Corian countertop. 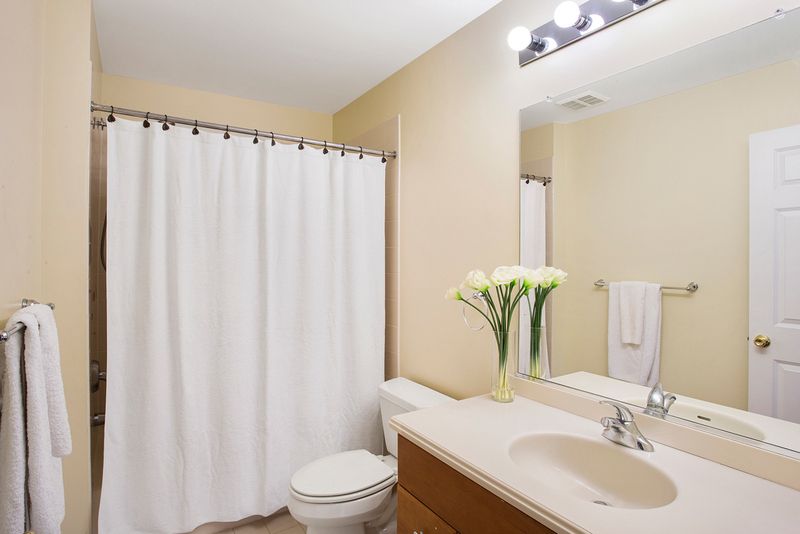 Kohler fixtures have been installed throughout the house. 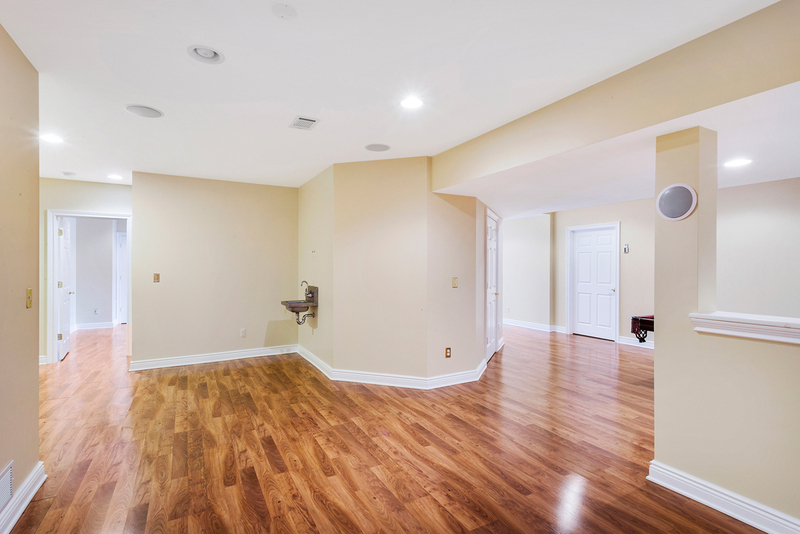 The large, finished walkout basement adds another living space to the home as it is finished with hardwood floors and other finishes of the same quality as in the upper levels of the home. A separate room finished with French doors make the room suitable for use as a guest suite and features a large tiled bathroom with huge stall shower. 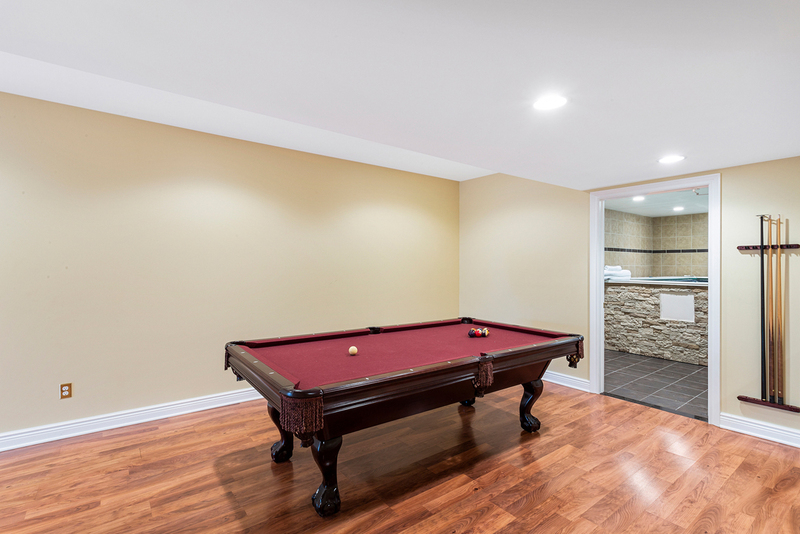 The basement has two other large areas perfect for a billiards room, playroom, or recreation room. A small stainless steel sink provides a starting point for a custom wet bar buildout. 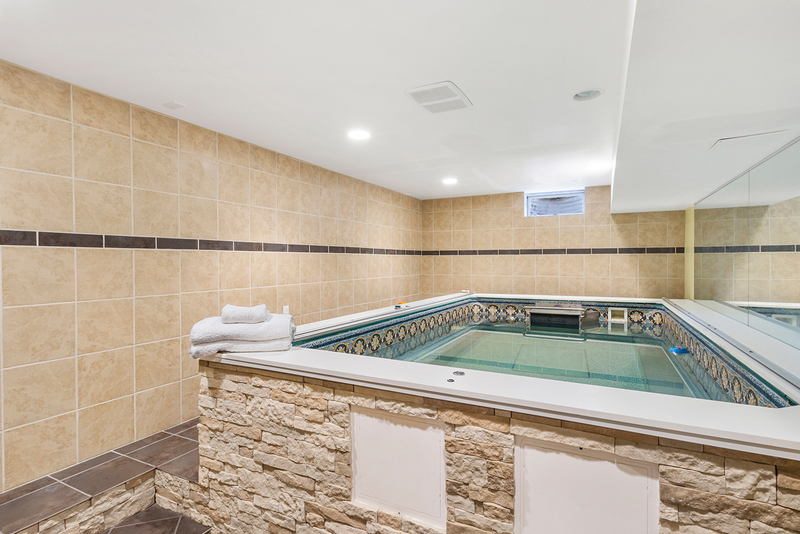 The basement also features a dedicated room with an indoor lap pool for the avid swimmer or triathlete. Sliding glass doors let in abundant natural light and lead to the backyard for convenience in accessing the space for entertaining and for using the bedroom and bathroom as a guest suite. Systems of the home include 200 ampere electrical service, a four-bedroom septic system, new well pump, multi-­zone central air conditioning, and multi­-zone forced hot air heating system with heat recovery ventilation system fired by natural gas. Each furnace is equipped with Aprilaire electronic HEPA air filters. Additionally, central-monitoring carbon monoxide and smoke detectors have been installed, all of which add to the ease of living in this elegant country retreat. The exterior of the home has landscaping and other upgrades that add to the enjoyment of the home’s living spaces. An expansive deck runs the length of the majority of the home and overlooks beautiful western views of the sweeping lawn and wooded buffer areas. It is large enough to accommodate multiple seating areas for dining and/or relaxing. Sun shades provide a canopy to provide comfort on hot days. The area beneath the deck is enclosed to allow use of this large space as a potting or storage shed. A ramp to the under-deck area and an extra-wide access door makes this space suitable for use as a workshop and/or for storage of riding lawn mowers, trailers, and other equipment. Landscaping beds surrounding the house have mature perennial plantings and room to accommodate seasonal annuals. The true stucco (not EIFS) exterior of the home adds an elegant finish to the architectural detail of the home. 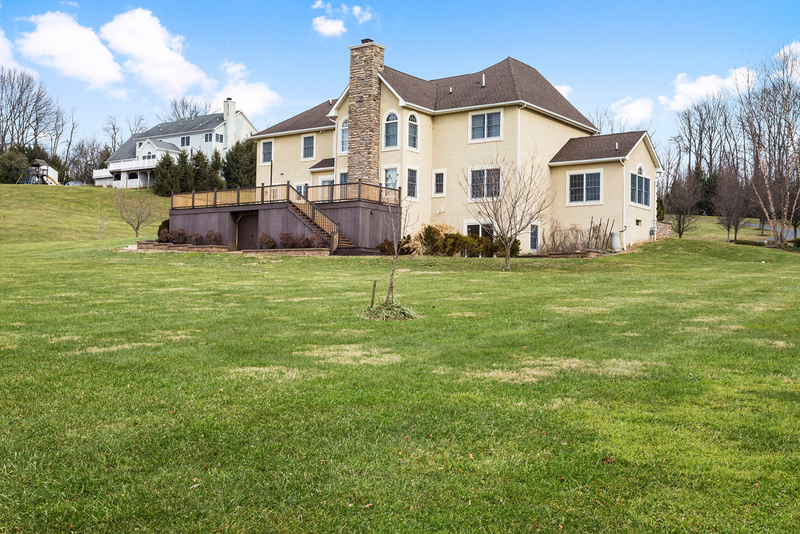 The property is located in Tewksbury Township, one of the most prestigious areas of Hunterdon County, a town renowned for its natural beauty, private estates and upscale lifestyle marked by the popularity of equestrian sports related to the nearby Essex Hunt Club, United States Equestrian Team and United States Equestrian Foundation, miles of scenic riding trails in the Tewksbury Trail System, and multiple private polo fields within the township. The township supports an active youth sports program that includes lacrosse, soccer, softball, basketball, tennis and baseball teams. Nearby outdoor recreation areas include Christie Hoffman Farm Park, Ken Lockwood Gorge, the Columbia Trail, and Round Valley Reservoir. It is served by Tewksbury Elementary School (designated a Blue Ribbon School in 2011), Old Turnpike Middle School, and Voorhees High School (designated a Blue Ribbon School in 2015) and is convenient to private schools (Gill St. Bernard, Pingry, Far Hills Country Day) with nearby shopping, golf courses and country clubs (Hamilton Farm, Fiddler’s Elbow, Trump National). Commuter highways (Interstates 78 and 287), TransBridge Line buses and NJ Transit trains allow for convenient access to New York City and Newark Liberty International Airport..